A characterful medieval castle can provide a wonderfully historic, atmospheric and romantic setting for a wedding. Whether the castle is a genuine medieval castle or indeed a 'mock' medieval castle (built post-medieval times but in the medieval style) makes no difference. It's all about the setting and many couples looking for a romantic wedding venue realise this. That's why Eastnor Castle has built a wonderful reputation as a wedding venue. 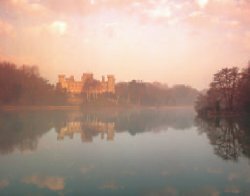 Eastnor Castle enjoys a glorious romantic setting with its own lake and both the castle exteriors and interiors take your breath away. It's not surprising therefore to learn that Eastnor Castle was selected as the wedding venue for a recent UK TV show called Battle of The Brides where the winners got to have their 'dream wedding' provided at a venue (and expense) that they otherwise could not have afforded. Read more about how this idyllic wedding venue was used in the programme.